A nationwide national strike throughout India has been scheduled on 8-9 January 2019, against the neoliberal, anti-worker policies of the BJP-led NDA government of Narendra Modi. The strike is organized by 10 Central Trade Unions (CTUs) and a number of independent worker's federations. “In order to serve the interests of the multinational companies with Indian corporate, the present government is pursuing blatantly anti-people, anti-workers and anti-national policies at the cost of severely damaging the national economy and destroying its indigenous productive and manufacturing capabilities. Such a regime must be defeated squarely to force the pro-people changes in policies on all fronts,” the CTUs said in statement. 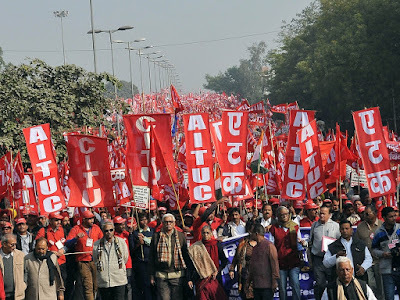 The ten Central Trade Unions which have called for the "All India General Strike" include CITU, UNTUC, AITUC, HMS, AIUTUC, TUCC, SEWA, AICCTU, LPF, UTUC, AIRF and NFIR. Independent national federations of workers and employees, of industrial and service sectors, central and state government employees in the railways, defense, education and health have confirmed their participation in the strike. The Central Trade Unions accuse NDA government for continuously ignoring the 12 point charter of demands on minimum wage, universal social security, workers' status including pay and facility for the scheme workers and point out the neoliberal policies of privatization of public and government sector, as well as mass scale hiring on contract. The Trade Unions have stated that the BJP-led government constantly tries to terrorize, harass and suppress any dissenting opinions over its policy. In a statement the World Federation of Trade Unions (WFTU), which represents more than 95 million in 130 countries of the 5 continents, expresses its internationalist solidarity and support to All India general strike on 8-9 January 2019 adding that the WFTU affiliates are taking a leading role in the preparations of the mass mobilizations. The WFTU statement points out the following: "The forthcoming “All India General Strike” will be the third and biggest countrywide strike against the neo-liberal policy of Modi’s governance which is aligned with the World Trade Organization norms and is variously affecting the working class of India worsening its living and working conditions. The World Federation of Trade Unions joints its voice with the call of the class-oriented trade unions for militant and massive participation of all the workers of the country regardless their sector or region. The WFTU supports the fair demands of the declared strike, given that the class-oriented struggle for a dignified life and work is the only way out from the capitalist barbarity."